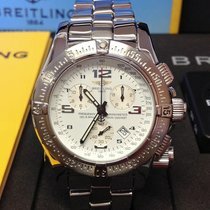 An excellent condition pre-owned 43mm case size chronometer rated superquartz movement (accurate to within 15 seconds a year) stainless steel Breitling Emergency Mission wristwatch (A73321) featuring a white Arabic numeral dial with silver sub-dials housing a date aperture at half past 4 on a full retail length stainless steel Breitling Fighter bracelet. This particular watch comes complete with its original box and all relevant paperwork being originally supplied as new on 9th June 2006. This incredible watch, as worn by the red arrows, is designed for pilots and aircrews. 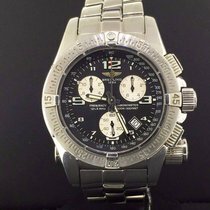 'The Breitling Emergency is an instrument watch with built-in microtransmitter broadcasting on the aircraft emergency frequency. 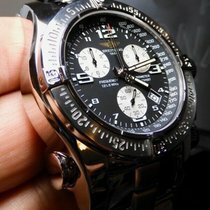 The watch serves as a compliment to the aircraft's own distress signal. With the antenna pulled out fully it will broadcast for up to 48 hours, over flat terrain or calm seas the signal has a range of up to 100 miles.